Sodalite is a chloric sodium aluminum silicate. The name refers to its sodium content. Sodalite’s crystal system is isometric, formed of rhombic dodecahedra. It rarely forms crystals, and appears most often in massive or granular habits. 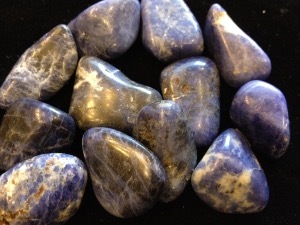 Sodalite is a primarily blue or grey but can be white, yellowish, reddish or greenish. The blue shades of Sodalite are found intermingled with white Calcite. The largest Sodalite deposit is in Bahia, Brazil, and other are in Canada, Namibia, India and the USA. This mineral is said to provide for the ability to arrive at logical conclusions via rational mental processes. It may eliminate confusion and to both equalise and simulate ones intellect to be compatible with each situation. Considered to be an excellent stone for use in groups; it may provide for fellowship, solidarity, and a commonality of goal and purpose, within the group. Sodalite tumbled to a smooth finish, an ideal pocket size stone, small enough to carry around with you. Tumble Stones can also be placed around the home for their energies or can just be nice decorative items. 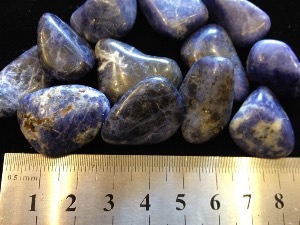 Sodalite crystal gemstones of varying sizes selected specially for your order.